ARRA News Service: House Votes Overwhelmingly to Audit the Fed! House Votes Overwhelmingly to Audit the Fed! WASHINGTON, July 24 – Congressman Ron Paul today applauded the passage by the House of Representatives of H.R. 459, the Federal Reserve Transparency Act. The bill, which calls for a full audit of the Federal Reserve System-- including its lending facilities and critical monetary policy operations-- passed overwhelmingly by a bipartisan vote of 327-98. The Fed’s Board of Governors and Federal Reserve District Banks are audited annually by the U.S. Government Accountability Office (GAO) the same way other federal banking agencies are audited. However, the Fed’s monetary policy operations are excluded from the GAO’s existing audit authority. H.R. 459 would require a one-time, complete audit of the Fed followed by a detailed report to Congress within 1 year of enactment. It also allows the GAO to conduct additional, future audits without restriction. Since the financial crisis of 2008, the Fed has tripled its balance sheet to $3 trillion, which is equal to 20 percent of the United States’ economy. Tags: U.S. House, H.R. 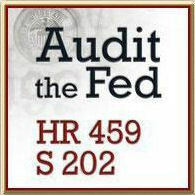 459, Audit the Fed, Ron Paul, Tim Griffin To share or post to your site, click on "Post Link". Please mention / link to the ARRA News Service. Thanks!